The Epcot Resort Area is comprised mostly of Disney’s BoardWalk Inn, Disney’s Beach Club Resort, Disney’s Yacht Club Resort, and the Walt Disney World Swan and Dolphin Hotels. The water in the center is Crescent Lake. It’s a beautiful area, and it comes alive in the evening. The International Gateway entrance to Epcot is within walking distance, or you can take a Friendship. Disney’s Hollywood Studios is also a walk or Friendship ride away. There are some fantastic restaurants around Crescent Lake, and that means that there are also scrumptious desserts! Here are eight that you might want to try. 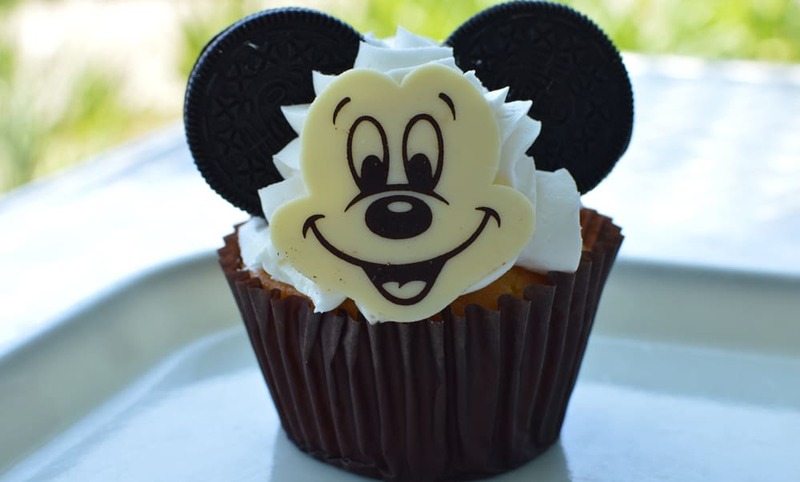 There is something special about the cupcakes at Walt Disney World, the pastry chefs seem to take pride in making as many unique creations as possible. At BoardWalk Bakery, you’ll find many delicious choices. You could pick a Mickey Cupcake, or maybe you would prefer a Strawberry Cupcake. The selection can change from day to day, so you might want to stop by more than once to see what is available. Fresh Mediterranean Market is a bit of a hidden gem. It’s open for both breakfast and lunch, and many people who are not staying at the Dolphin do not know that it is there. That’s too bad, because they are missing out on something spectacular at lunchtime. There is a dessert buffet, and it is complimentary with any salad, wrap, or sandwich. The desserts are bite sized, so you won’t feel guilty about sampling a few of them. They are also delicious. Disney’s Yacht Club Resort has a nautical New England theme, which means that Warm Apple Cobbler fits right in. The dish is decadent and simple at the same time. It’s filled with Granny Smith apples, which are a favorite for baking in New England. Buttered streusel adds to the flavor, and it’s topped with frozen vanilla custard. Of course that custard won’t stay frozen long, since the apple cobbler is served warm. The dish is so good that you’ll be tempted to lick your plate. Ample Hills Creamery is known in New York City for its creative and fresh ice cream. Disney’s BoardWalk is the first location outside of New York. There are flavors such as Chocolate Milk and Cookies, PB Wins the Cup, and Ooey Gooey Butter Cake. Sally Sells Seashells is a flavor that is exclusive to Walt Disney World. Ask for samples, the friendly staff is happy to let you try as many as you want. Since you’ll still have a hard time deciding which flavor is the best, order an Ice Cream Flight. You will then pick six flavors to enjoy! It’s a lot of ice cream, but that’s okay. You’ll enjoy every spoonful. Yachtsman Steakhouse offers possibly the best steak at Walt Disney World. Try to save some room for dessert. You can’t go wrong with any of the choices, but there is something special about The Admirals Cake. The presentation will wow you, but not as much as the flavors. It’s dark chocolate, caramel crunch, chocolate sponge cake, Bananas Fosters jam, and more caramel for good measure. It’s the perfect way to end a special meal. Il Mulino serves classic Italian entrees, so it makes sense that you will want to end your meal with a classic Italian Dessert. Tiramisu is a dessert for coffee lovers. Lady fingers are soaked in espresso and coffee liqueur. It’s topped with mascarpone cream. It’s sweet, but not too sweet, and a classic way to end a classic meal. ESPN Club is mostly a sports bar and restaurant. It’s heavy on the burgers, fries, nachos, and other ballpark food. Don’t fill up all the way on Slam Dunk Salads & Soups or Season Ticket Sandwiches. There are some great Post Game Desserts as well. One that you might want to try is Carolina Buttermilk Pie. It’s a small individual sized pie, topped with whipped cream. There’s seasonal fruit on the side. It’s a refreshing dessert that you’ll want to savor while you’re watching the big game on one of the restaurants many TVs. You might want to skip your dinner and jump right into dessert if you plan to order The Kitchen Sink! This is more than just a sundae. It’s eight scoops of ice cream, topped with cookies, cakes, brownies, bananas, cherries, sauces, sprinkles, and a full can of whipped cream. The Kitchen Sink is big enough for four, and even then you might have a hard time finishing it. Chocolate Lovers, Neapolitan, and a vegan version are also available. If you want to attempt to tackle The Kitchen Sink you’ll want a reservation. Beaches & Cream is small, and spots fill up fast.